Cancellation policy, month prior to arrival we charge 50 % of the whole amount. 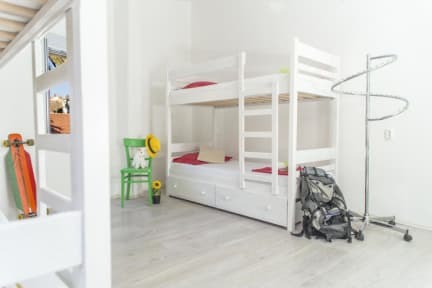 The White Rabbit hostel is a hostel just 5 meters from the very center of Hvar town. It is owned and run by two young travelers, who with years of experience, know exactly what makes a good hostel! Wonderful bright and spacious shared rooms. A lively summer guest bar serving beer and refreshments every evening and fresh, healthy breakfast in the morning. When you travel and don’t know what to do who do you ask? Locals. Having lived here all our lives we know everyone and everything you can do. We can help you make the very best of your time in Hvar, giving you a truly exclusive experience. From boat trips, excursions to adventure activities. From pub crawls to the best party hotspots we will give you all the information you need. It is our passionate goal to provide you with an unforgettable experience while in our wonderful home of Hvar. 3. Sing if you feel like singing. 4. If you're out all night and you had a few drinks it doesn't mean everyone else was, some may be sleeping. 5. If you need anything - ask. The White Rabbit has a 24/7 reception. The whole payment shall be done at the check in; it's cash only (Euro or Kuna). Nice hostel. Everyting was Good, just a bit noisy but then again, we were in Hvar so What do you expect! Thanks for the Good Experience! Nice hostel, nice vibe and the girls from the reception are awesome and helpful!